Leather is easier to clean than fabric and very stain-resistant. Because leather maintains well, there’s a better chance of a high resale value. When it comes to style, leather is typically considered the more luxurious choice. If you or a family member has allergies, leather could be your best bet. Dust, pet dander, and other allergens settle into cloth, whereas with leather, you can wipe the seats clean. In the winter, leather seats can be unbearably cold, and in the summer, seats absorb the heat and become hot enough to actually burn your bare skin. Leather is more expensive than cloth seats. It’s also more expensive to replace or repair. It responds negatively to constant wear and tear. While leather might be easier to clean, it’s not easier to maintain. When you get a car with leather seats, know that they’ll need to be properly cleaned and conditioned frequently, or else they will show signs of wear and crack. Cloth seats will always be more affordable. Cloth is easy to replace or repair. Year-round, your seats are going to be more comfortable. They won’t become dangerously hot or horribly cold! Since fabric is so easy to make, you have varied choices with a wide range of quality. Unlike leather, there’s hardly any maintenance required for cloth (short of taking care of accidental spills and messes). If you’re constantly carting around toddlers who spill their food, cloth might be a risky choice. It’s much harder to clean and soaks up spills and stains easier. Cloth absorbs smells. If you’re unlucky enough to have anything spill, you could be smelling it for a long time. Because of all this, there’s less chance for a high resale value with cloth seats. If you or a family member has allergies, cloth can absorb the allergens in the air. 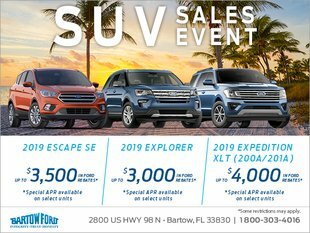 Whether you want a car with leather or fabric seats, the experts at Bartow Ford, your Winter Haven area Ford Dealership, can help you find a vehicle that suits your needs. Give us a call today at 1-800-303-4016 to learn more about what we have to offer!